Discussion in 'General Discussion' started by davidt, Dec 18, 2018. As mentioned by an anonymous person (original post), Low In High School re-enters the Official Vinyl Albums Chart Top 40 (Dec. 14-20, 2018) at #19 with the release of the Deluxe version. Nice to see the album keeps doing well. We can't find the LP in France ! Aren’t you tired after all those gigs you’ve done ? To put things into context this is the vinyl chart. In the real charts both Mama Mia and A Star Is Born were number 1 albums and have been in the charts for 22 and 10 weeks. get ready for the Flathead Mike and DramaJohnny media tours. Those two wabos will probably be on every C list UK webshow talking about Moz now. 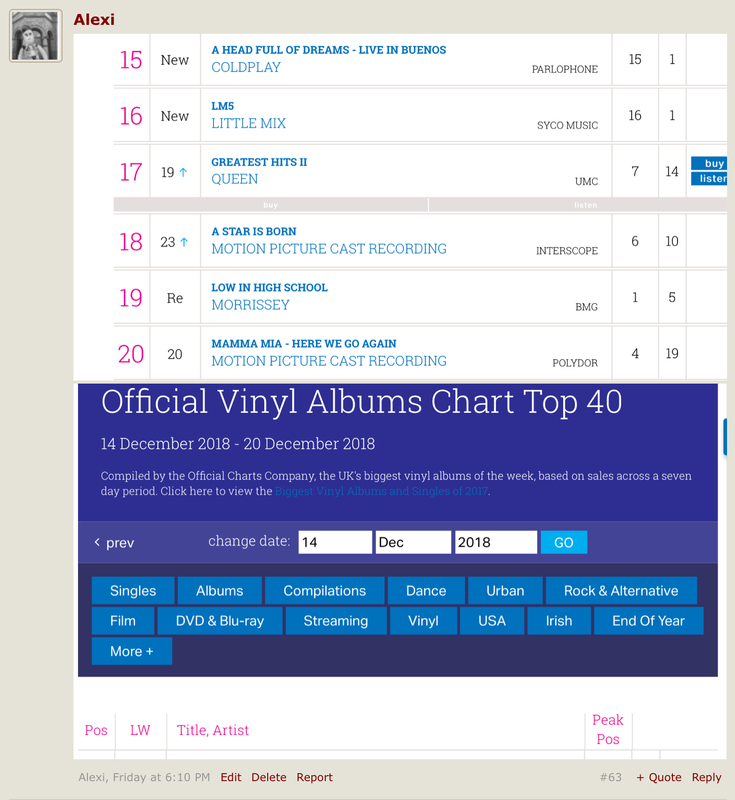 Congrats Morrissey for the re-entry in the charts for LIHS though a 2CDwould be a buy. To put things into context both of the other albums are the products of the Hollywood Industrial complex and their ratings are due to the publicity machine around both movies. Morrissey s success is down to himself and his loyal fans and very little promotion. It's great that LIHS has reentered the charts. Those of us who like him are pleased for him. That's it love, get into the Christmas spirit. Begrudgery, Bah Humbug. Does Skinny’s band not feature? there is no Call the Comet deluxe edition. If you crawl along the floor of your school you'll find it eventually. Exactly. Sure when that Select magazine came out showing Moz eating grapes by the pool some people probably thought: 'I betcha that pool isn't heated'. Belligerent ghouls. I hear you but so what. Actually that would make a good Moz song title. What I mean is: those films are bollox and so is the music. As Depeche Mode once said: Music For The Masses. And I agree with you but people tend to get carried away with something that really isn’t that great. It’s good that people are buying his material but calling it out that it’s a better placing than x or y is just daft.